I found out through a fellow sketcher that there was going to be a Toronto mini Comicon for the holidays, so a couple of us went out on Sunday to check it out. I figured it would be a great opportunity to sketch fun costumes, and it was. There was all kinds of costumes from the very simple to the intricate. I saw many known characters like Sailor Moon, Batman (he was uber tall), Dr Zoidberg, Picard, Poison Ivy and a couple unique and personalized characters like pink spiderman and a creepy realistic zombie in a wheel chair. It was fun to see various characters walking around the convention centre, checking out the items for sale and taking pictures. It's impressive to see their level of creativity especially considering those made by hand. 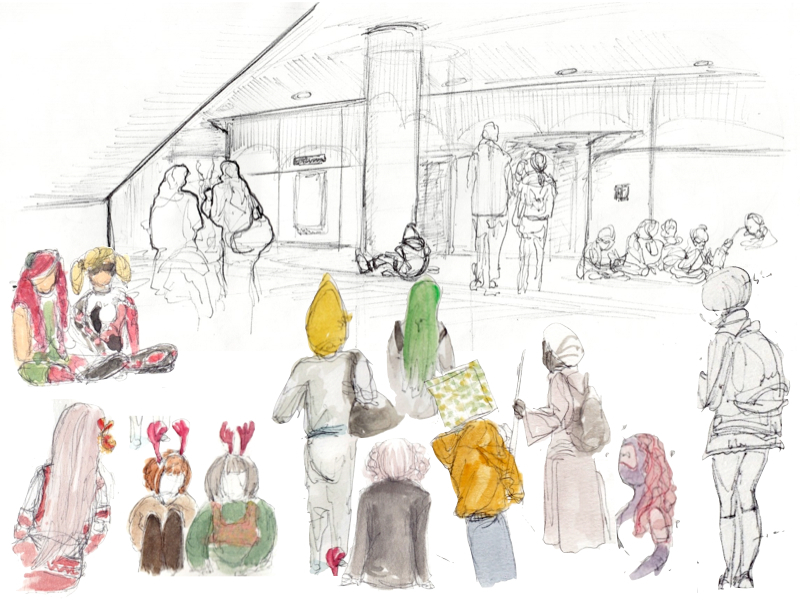 I was able to draw a few of the people sitting around or standing long enough for me to capture them. There was so much more to draw! I saw a lot of creative and talented people in this conferences. It's definitely a feast for the eyes and something that I will do again, perhaps for the annual ComiCon in March. Toronto Holiday Comicon is really a useful information. Thanks for sharing it.